2050 Gordon Dr, Naples, FL.| MLS# 219004319 | Realty Group of Southwest Florida, your number one choice for homes in Southwest Florida. H.14115 - This Gordon Drive estate is the pinnacle of beachfront luxury living comprising over 1.5 acres and more than 150 ft. of direct beach frontage. Magnificent panoramic Gulf views from nearly every vantage point! 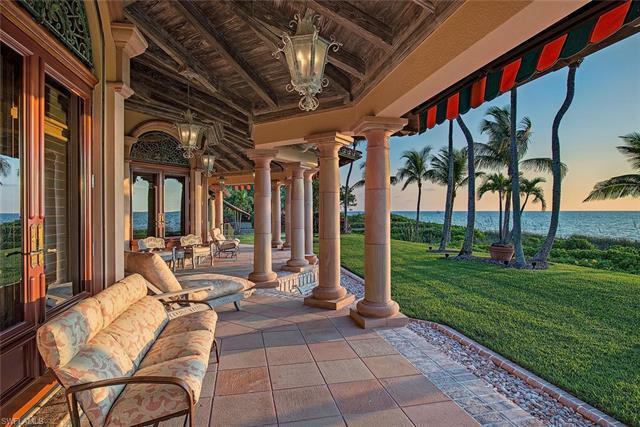 This sprawling estate offers just under 5, 400 Sq.Ft. of living space featuring gorgeous custom stone, marble and wood flooring, detailed Artisan Guild custom millwork, exquisite chandeliers, multiple intricately carved marble and stone fireplaces, a gourmet kitchen and upgrades throughout. Luxury and lifestyle redefined! Spectacular, park-like grounds with meticulous landscaping, lush, tropical foliage and fish ponds create a haven for indoor and outdoor entertaining! Many distinct areas for gatherings, all with Gulf front beach access and mesmerizing views. Truly a remarkable slice of Naplesâ finest neighborhood.